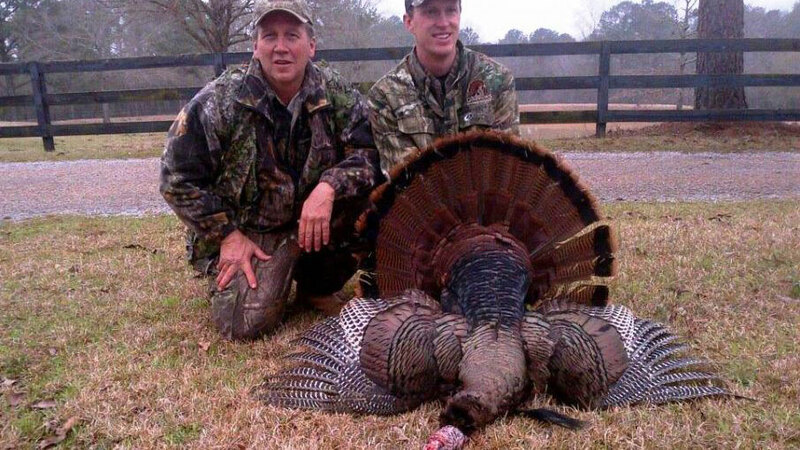 Gabe Thornton (right) of Academy Sports + Outdoors won the 2014 Alabama Governor's One-Shot Turkey Hunt competition with a 23.6-pound gobbler Wednesday. He was hunting on property owned by Dan Moultrie (left). PRATTVILLE, Ala. — As Alabama Gov. Robert Bentley celebrated the acquisition of Remington Arms as one of the state’s newest businesses, state conservation officials and their partners in the Governor’s One Shot Turkey Hunt program used Remington shotgun shells and other turkey hunting paraphernalia to lure even more industry to the state. Bentley invited CEOs and other top officials of out-of-state companies to participate in his One Shot Turkey Hunt this week, offering trophies and prizes to the one who bagged the biggest gobbler. Landowners from the area shared their turkey woods for the two-day hunt, while guides did their best to lure turkeys into gun range.Gabe Thornton, senior vice president/store operations for Academy Sports + Outdoors, won the competition with 23.6-pound gobbler, which scored 70.35 according to the National Wild Turkey Foundation scoring system. The bird had a 10 ¾-inch beard and spurs measuring 1 3/8 and 1 1/4 inches. Guy and hunt organizer Dan Moultrie, chairman of the state’s Conservation Advisory Board and founder of Moultrie Game Feeders, said the Turkey Hunt raised more than $230,000 for a variety of youth-oriented hunting programs. Among the beneficiaries are Hunters Helping The Hungry, Youth Dove Fields, Becoming An Outdoor Woman and Archery In Public Schools. The money will also fund the Dan Moultrie scholarship to the School of Forestry and Wildlife Sciences at Auburn University and the Larry Drummond scholarship to the College of Arts and Sciences at the University of Alabama. “This is the sole source of funding for these programs, and they were in dire need of a successful event,” Moultrie said. Moultrie helped found the Governor’s One-Shot Turkey Hunt in 2002 after attending the One-Shot Antelope Hunt in Wyoming. Not only does he have the success of the program to celebrate, but Moultrie also had a share in the champion gobbler, which came from his hunting property. Lowndes County District Judge Adrian Johnson, who guided Bozeman’s guest hunter, said he volunteers in order to share his passion for turkey hunting with others, especially those new to the sport. “It’s the whole experience — being able to enjoy God’s creation and to experience the challenge of outsmarting a big, old gobbler — that’s what it boils down to,” he said.